The reading of Scripture and the exposition of it are primary acts of worship in the church; they are offerings given to God in reverence and devotion. Reading god’s holy Word in the assembly without understanding, interpretation, or enthusiasm undermines the foundation of all worship, which is to hear from God. When the reading of Scripture is with clarity, conviction, and power, it sets the Word of God before the people in a way that demonstrates its authority and demands a response. The reading of Scripture should be one of the most powerful parts of worship–every word spoken from the Word is from God (Allen P. Ross, Recalling the Hope of Glory, 506). William F. Buckley Jr., died this morning in his study in Stamford, Connecticut. He died while at work; if he had been given a choice on how to depart this world, I suspect that would have been exactly it. At home, still devoted to the war of ideas. As you might expect, we’ll have much more to say here and in NR in the coming days and weeks and months. For now: Thank you, Bill. God bless you, now with your dear Pat. Our deepest condolences to Christopher and the rest of the Buckley family. And our fervent prayer that we continue to do WFB’s life’s work justice. Are there things we should avoid when we pray in public worship? I listened to a sermon recently in which a well-known expositor began his sermon by addressing Satan in his prayer. Something to the effect of “Satan, you have no authority, you are bound . . .etc.” I listened to another sermon where the closing prayer fleshed-out the preacher’s final point which he had not developed during the sermon. As you read the NT, you find that the apostle Paul uses this formula a total of 14 times in his epistles, and always after a rhetorical question. In doing so, his point is to say that the idea expressed in that question is absolutely unthinkable, even abhorrent. In other words, this is the kind of thing that is so absurd that it shouldn’t even enter the believer’s mind as a possibility, and so it is repudiated by Paul in the strongest possible terms: me genoito! The fact that so many Jews have refused to believe in the Messiah shows that God was not faithful to keep His promises to His chosen people (Rom 3:3-4). God’s punishment of the wicked is a grand demonstration that He is unrighteous (Rom 3:5-6). The fact that both Jews and Gentiles are justified through faith alone means that the Law is nullified (Rom 3:31). Since grace abounds all the more where sin is committed, believers should continue in their sin in order to experience even more grace from God (Rom 6:1-2). Being under grace (rather than under law) should motivate us to lighten up in our pursuit of holiness and help us feel comfortable to sin from time to time (Rom 6:15). Because it arouses sinful passions, the Law itself is evil and sinful (Rom 7:7). Because it arouses sinful passions, the Law itself is to blame for the sinner’s death (Rom 7:13). God’s sovereign choice to set His love upon one individual and His hatred upon another (and before either of them were born!) is proof positive that He is not a righteous and just God (Rom 9:13-14). The current unbelief of the majority of ethnic Jews is evidence that God has rejected His chosen people Israel (Rom 11:1). Israel’s rejection of the Messiah means that the nation has permanently forfeited the covenant promises of Yahweh (Rom 11:11). This is why you should not call in your cake orders over the phone. 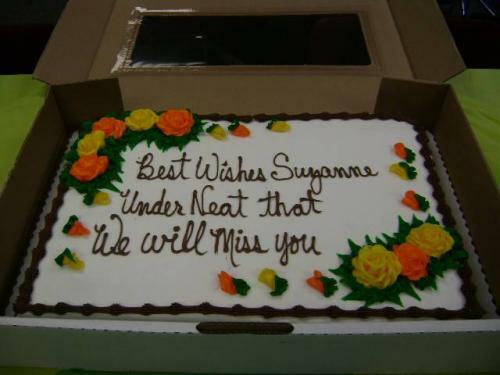 read: “Best Wishes Suzanne” and underneath that, “We will miss you”. In regards to the disciples we see that when they were called in John chapter 1 that Philip reported to Nathanael that “We have found Him of whom Moses in the Law and also the Prophets wrote–Jesus of Nazareth, the son of Joseph” (Jhn 1:45). The way they identified the Messiah was by the OT Scriptures. They knew the expectations of the Law and Prophets and recognized Jesus accordingly. This does not mean that they grasped all the implications of such belief which time would show they did not. Nevertheless, in John 6:69 Peter would later confess on their behalf that they had “believed and come to know” that Jesus was “the Holy One of God” (an allusion to Isaiah 54:5). Later when Peter stood on Solomon’s Porch and preached his second sermon (Acts 3:11-26) he noted that many of them were ignorant (3:17). However he reminds them that “the things which God announced beforehand by the mouth of all the prophets that His Christ would suffer, He has thus fulfilled” (3:18). He tells them that even Moses spoke of a final prophet (3:22) and that “likewise all the prophets who have spoken, from Samuel and his successors onward, also announced these days” (3:24). It was not for a lack of information that many would not believe. A key texts on this issue is Luke 24 where Jesus meets the two men on the road to Emmaus. They are having a conversation with the resurrected Jesus but fail to realize who he is. Luke alludes to the fact that it might be because they had unrealized expectations (cf. 24:21). When Jesus corrects them, calling them “foolish,” he says their lack of understanding is because they didn’t believe what the prophets had already spoken (24:25). So Jesus goes back through the OT and shows them that the Messiah had always been anticipated (24:27). Jesus did not need to insert Himself into the OT in order to show that the Messiah was there. Jesus did not chastise them for failing to spiritualize the OT but for not believing what it so clearly taught. The NT begins with the assumption that the OT informs the message of the NT (Matt. 1:1). The failure on the part of the people to see the Messiah in the OT was not a hermeneutical problem. Their problem was not that they failed to spiritualize the OT but that they would not take it at face value. So it wasn’t for a lack of information that people refused to believe, it was hardness of heart against God’s testimony of Himself in the Scriptures. Time and again it is noted that they rejected the message of the OT and therefore they missed what the OT anticipated. We see this today with modern Jews who have the same Hebrew Scriptures yet reject its message in favor of a liberation-styled interpretation whereby the Scripture is nothing more than the story of Israel’s struggle. However, if they really believed Moses they would believe in what Moses hoped for which has now been fulfilled in Jesus (John 5:46-47). I see a similar issue with some Protestants who reject the inerrancy of the OT and as a result have no basis for their many man-made conceptions of who Jesus is. This is why in many respects the Jesus of modern tradition looks different than the Jesus of Scripture. This is also why understanding the OT in its original context and preaching the OT is crucial in order for us to develop a foundational and robust understanding of our glorious Lord Jesus Christ. When you come to Jude 22-23 you realize that the conservative Greek scholars don’t agree on the original manuscript. One scholar notes “The most striking feature of the textual tradition is that some witnesses divide the text into two clauses, while other witnesses divide into three.” That is a somewhat signficant variant. In addition to this one must determine if the main imperative should be “have mercy” (eleeite) or “reprove” (elenchete)? Also, should diakrino be translated “doubters” or “disputers”? Even if i were a Greek scholar, like Dr. Thomas Schreiner, who spent numerous hours trying to sort out these problems for his commentary on Jude; at the end of the day Schreiner writes “certainty on whether the text should be divided into two or two clauses cannot be attained.” If Schreiner, a wonderful N.T. scholar, who probably sight reads the Greek text comes to this conclusion, where does that leave the seminary trained pastor? How many hours would you recommend the typical pastor invest trying to sort out P72 and Vaticanus B and Codex Alexandrinus in addition to the numerous journal articles that are written on the subject (S. Kubo, J.M. Ross, etc)? One could spend his entire twenty hours on this issue and then come to the same conclusion as Dr. Schreiner….